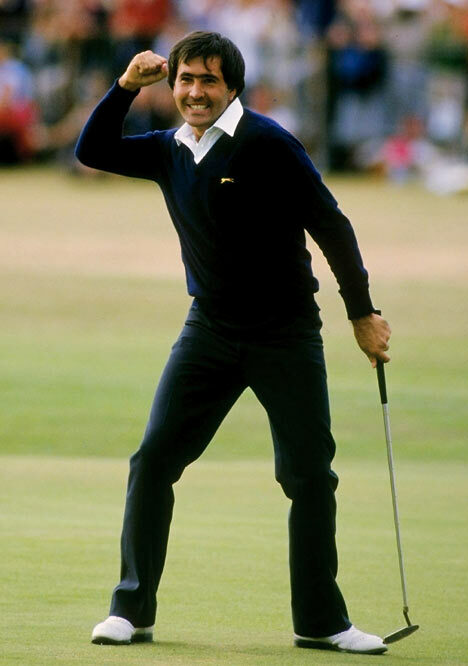 Seve Ballesteros, one of the great golfers of the twentieth century, died last Saturday. As so many have noted, his greatness goes far beyond his golfing record. The record alone doesn’t hint at his inventive genius from bunkers or chipping or on the green. Nor does it hint at the transformative role he played in restoring European golf to greatness and making the game the international success it is today, as best manifested in the Ryder Cup mania we now take for granted. With all that has been written about Seve, and all the videos of him shown on TV, there’s little I can add. The best stories are the ones about the awe his fellow competitors held him in, their eagerness to watch him play. I wish I could quote one I heard on the PGA Tour Network on satellite radio yesterday, but it went by too fast as I was driving to school. The gist of it was that the narrator — I came in in the middle and never heard who he was — found himself playing with Seve and Arnold Palmer, many years ago. Seve hit two impossible shots during the round, one from just behind a rock, right over it and onto the green, another out of a plugged lie in a greenside bunker to within two feet of the hole. Each time, Arnie looked over to the narrator to ask, have you ever seen such a shot before? Here’s more, from John Huggan, writing in The Scotsman. Still, for all his success and obvious desire to succeed, for Seve a round of golf was always more about the journey than the destination. So it is not for mere victories that he will be remembered with such affection by those he played with and against over the course of a 33-year professional career. Everyone has a Seve story that begins, “you won’t believe what he did”. Even Nicklaus has been impressed. The 3-wood Seve struck from a cavernous fairway bunker to the edge of the final green at PGA National in Florida during the 1983 Ryder Cup remains the greatest shot the game’s greatest-ever player ever saw. Beat that for an accolade. Such feats of extraordinary brilliance were commonplace though, mere extensions of an artistic temperament ideally suited to the creation rather than the mere striking of shots. Seve learned those skills on the vast beach at Pedrena, the tiny fishing village on Spain’s windswept northern coast where he was born and where he died, early yesterday morning, at the tragically early age of 54. Armed with only a rusty old 3-iron, the pre-teen manufactured all kinds of shots: high, low, slice and hook and everything in between. “Never when you are a child do you think you are especially gifted for something,” he said. “What you do notice is passion – because you feel it. Passion makes you devote yourself to what you really like. “When I was paired with Seve in the 2000 Volvo Masters at Montecastillo I was so excited,” recalls former US Open champion Geoff Ogilvy. “As a youngster I used to watch tapes of all the majors and my favourite was the 1988 Open at Lytham. “Seve shot a beautiful 65 on the final day to win by two strokes from Nick Price. But two things stand out: the chip shot he hit on the last hole – the prettiest I ever saw – and his smile and how much fun he made it all look. I must have watched that chip 1,000 times. “Anyway, when we played together, his best game was already well behind him. But for the first and maybe the last time, I played a whole round more interested in the shots hit by my playing partner than in anything I did myself.